It’s our annual sponsored sleep out. It’s a great chance for people to come together to raise awareness of homelessness and raise vital funds to support YMCA Northumberland’s preventative work with vulnerable young people. Participants brave the cold, sleep in a cardboard shelter for one night and get sponsored for their efforts. Across the UK, and locally, homelessness services are experiencing an increase in demand for the support they offer. Rough sleeping is on the rise with there being an increase of 15% from 2016 to 2017, and an increase of 169% from 2010. Families are struggling to pay their household fuel bills, rent and mortgages. Many people have lost their jobs, and new employment opportunities are very scarce. These are very difficult times. YMCA Northumberland concerns itself with the decreasing prospects for our young people, especially those that have few qualifications and little or no work experience – these are the young people, perhaps, most likely to be living in poverty and at greatest risk of homelessness. For business groups Sleep Easy is not only a challenging and eye opening experience, but a great opportunity for team building, to have fun and to meet some of your CSR targets. In previous Sleep Easy events we have raised over £4000. We hope, that with your help, we can raise just as much, if not more, in 2019. When is the next Sleep Easy? Our next event will take place on Friday 15th March 2019, 7pm till 7am. The entry fee for 2019 is £5, which goes towards the cost of running and administering the event. Before registering, please click here to read our Terms and Conditions for Sleep Easy 2019. For registration and electronic payment, please click here to sign up via Eventbrite. This will also give you the option to set up your Virgin Money Giving fundraising page straightaway. When you register for the event through Eventbrite, you will receive an email with a link to our ‘Sleepers’ page which contains all you need to know about the event and how to begin fundraising. We will then keep in contact with you via email, sending updates and further information closer to the event. Sleep Easy isn’t for me. How can I help? You can help by sharing information and posts about the event from our Facebook and Twitter pages. 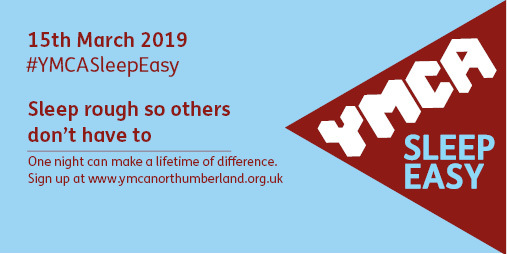 We will be using #SleepEasy19 and #YMCASleepEasy to keep everyone in the loop via social media. You can also sponsor individuals taking part or donate directly to the Sleep Easy appeal through Virgin Money Giving by clicking here.